Betty Jean Gregurich (née Christensen), age 96, passed away Thursday, January 17, 2019, at Valhaven Nursing Home. Betty was born to Albert and Hallie Christensen (née Hyatt) on March 5, 1922, in Council Bluffs, IA. Betty married Harold Gregurich on September 6th, 1942 and lived in Omaha for several years before moving to Fremont, NE. They resided there for over forty years and were the owners of Parkview and Sunkist Dry Cleaners. 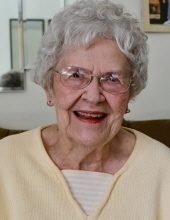 Betty enjoyed working until the age of ninety-two first in the dry cleaning business and later doing demos at grocery stores and as a cashier at Big Dog Liquors in Elkhorn. Betty was a talented and published author and poet, and she loved camping and being outdoors. The many loves in her life included: her grandchildren, great grandchildren, and Tom Selleck in the show Blue Bloods. She was a wonderful, whimsical, one of a kind lady, who lit up any room she entered and made everyone around her feel special. Preceded in death by her parents, husband of 55 years Harold, and daughter Janice. Sons Larry (Susan) Gregurich of Valley, NE, Gary Gregurich of Omaha. Grandchildren: Loralee (Don) Coulter of Elkhorn, NE; Garth (Annette) Hosch of Mesa, AZ; Hallie (Lee) Carl of Mesa, AZ; Bryce (Ricci) Gregurich of Valley, NE; Tracie Gregurich of Kansas City, KS; and Kris Gregurich of Valley, NE. Great-Grandchildren: Mason and Emerson Coulter, Caleb and Isaiah Carl, Truston and Melodee Hosch, Gage and Gavin Gregurich and Kyle and Kyson Gregurich. Many other nieces, nephews, family and friends. Celebration of Life event (casual attire): 5:00 - 7:00 PM on Friday, January 25th, 2019, at The Pines Country Club, 7516 N. 286th St., Valley. To send flowers or a remembrance gift to the family of Betty J. Gregurich, please visit our Tribute Store. "Email Address" would like to share the life celebration of Betty J. Gregurich. Click on the "link" to go to share a favorite memory or leave a condolence message for the family.